is already underway. Wonderful writers. Come on down. And, there is a 1-2% bonus for anyone who attends a reading and writes me a brief (one paragraph to one page) review. Sir Gawain paper doll set. Really. NOTE: There is a lot of material about Sir Gawain online because the poem is so often read in courses. Be careful what you are looking at; lots of pages are student projects or hobby projects. Which is fine, as long as you know what you are reading. Only use scholarly resources for your papers. When emailing an instructor, it is helpful to put the course # in the subject line. Include an informative statement about the topic of your email. For example: "ENGL 2101: Question about second assignment" (drop the quotes). Emails without subject lines often get confused for spam and deleted. If you are not using a university email account, it is all the more important to have a clear subject line. On that latter point, many professors require email to be from a university account. I am relaxed on this issue. Be aware, though, that an address like sexy_thang@hotmail.com does not create a professional impression. When addressing your instructor, "Dr. X" or "Professor Y" are preferable to "Hiya" or "Yo!" Email is generally more relaxed than traditional business or professional correspondence. But, business or professional email still needs to be a lot more formal (i.e. polite; well-written) than text messages to your homies. K? Make your message clear and explanatory. Your instructor talks to a lot of students in a given day, so "I'm writing about what we were talking about" is not always that helpful. Please include your full name and student # in the body of your email. Be aware that some email may trigger spam filters and therefore not get delivered. Check with the instructor if you do not receive a reply. Addendum (31/10/06): Here is a more detailed discussion (via Terminal Degree). Someone is withdrawing from the course and is interested in selling her texts; if anyone has not yet bought a set but were planning to, they may want to contact Ashley at c0x40 at unb dot ca. But, you will need some mead. Here are some recipes. And remember, please don't drink and smite. Hear parts of the poem read in Old English. The Wikipedia entry, while the content is perhaps not the best, has a lot of great links, in particular to popular culture manifestations of the poem. www.BeowulfTranslations.net: hobbyist Syd Allan's page on various translations of the poem and lots more. His page on comics is particularly fun. (nb. There is an interesting bit here about why you should never buy an essay.) This guy loves the poem. 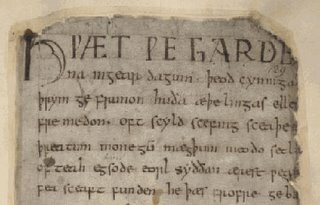 An Introduction to Anglo-Saxon Manuscripts: a short online seminar. Not about Beowulf specifically, but of interest. Beowulf & Grendel: official site for the 2005 film. IMDB page. There is another film, due for release in 2007, for which fantasist Neil Gaiman has a writing credit. This should be good! SF adaptation from 1999 with Christopher Lambert. It was good to meet you all; I think we will have an interesting term together. I can't promise any more classics translated into text-message-ese, but we will try to muddle through with the originals. (Well, okay, here's Hamlet, even ruder than R&J. But this is the last time I will pander). One important thing that I should have mentioned (it is in the syllabus and here on the weblog, but still ... ): if you have taken English 1200 you cannot take this course. You should not have been allowed to register but at least two of you were, so heads up: if you have passed 1200 you will need to go elsewhere. (For your info., 1200 is no longer offered and the material it covered has now been divided between 2101 and 2102, both of which are required for Majors and Honours in English). 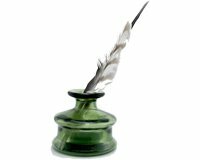 to the weblog for English 2101: Literature in English I at UNBSJ. Here you will find links and updates and a copy of the schedule and assignments. More importantly, blogging is interactive  you can leave comments to any post  and so this blog can serve as a venue for continuing the conversations we will have in class. Please note: All readings are from the Broadview Anthology. Texts listed under "Reading" are required; texts listed under "Additional reading" are optional but recommended. Videos are subject to availability. Always check online for any changes or updates to this schedule. See the glossary (80–82), the genealogies (83), and the note on the Geatish-Swedish wars (84). Also, please read "The Medieval Period," xxvii-xli. Choose one of the following two options and write 4–5 pages. 1. a) Choose an object or situation, not necessarily sexual (bonus points for making something boring sound steamy), and describe it first as Aphra Behn, and then as John Wilmot, might have done. Verse would obviously be nice here, but the emphasis should be on the differences in the writers' voices (1–2 pages). 2. Is Gulliver "gullible"? How does Swift indicate how we are to think of Gulliver, given that the narrative is written in the first person (i.e. in Gulliver's own voice). Does Gulliver change over the course of the books? If so, how is this indicated? 1. a) Write a sonnet about a contemporary situation (love is still an option, of course; but contemporary love). Obviously you are not all skilled poets; evaluation will be based on the display of knowledge about the sonnet form and tradition. Explain how it adheres to, and/or distinguishes itself from, sonnets of the Renaissance. Your emphasis should be on the Renaissance traditions. You are encouraged to refer to sonnets read in class. Short written assignments (60%) — There will be a short (4–5 pp.) written assignment in each of the three sections of the course. Participation (10%) — Each student will be expected to participate in discussion and group-work in the classroom, and in discussion online in comments at this web site. Attendance will be taken. Final exam (30%) — The final exam will cover material from all term. It will be closed book and take place during the exam period. The Syllabus is finished and is available for download as a PDF file, ready to print out. Always check this weblog, however, for any updates and changes. An online schedule will be has been posted soon, as well as descriptions of the course assignments. WebCT has been enabled. There you will find your marks as well as class notes.